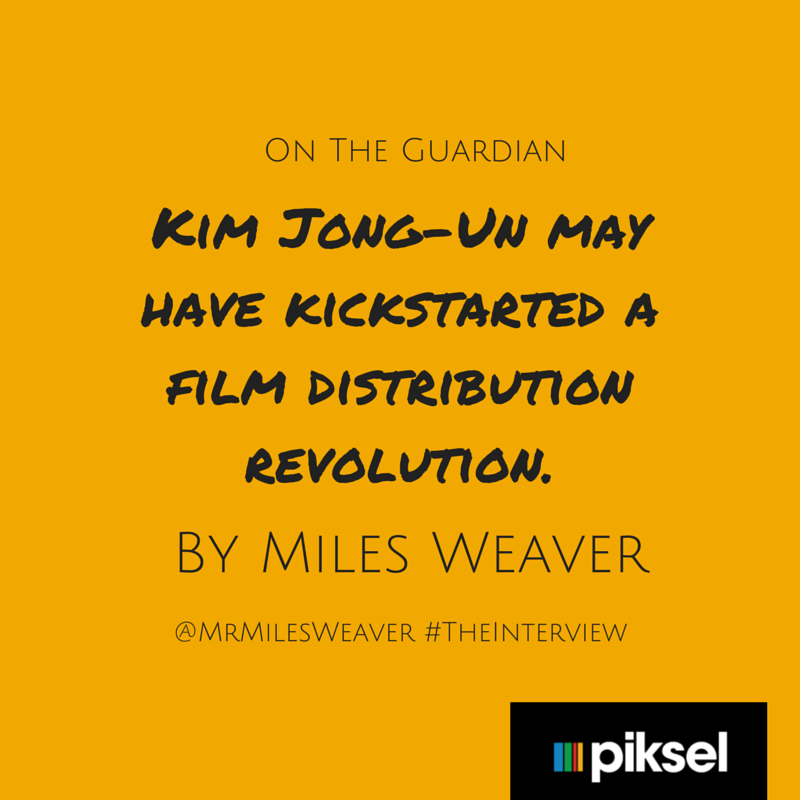 The haphazard online launch of The Interview was still a resounding success – and has the cinema chains quaking in their boots. Kim Jong Un. Dear Leader. The Beloved Leader. The Supreme Leader of the Democratic People’s Republic of Korea. The dictator has many unnecessarily long titles, and I’d like to add another to the list: the man who may have kick-started film distribution revolution. At the end of 2014, Sony Pictures moved to release the dubiously intentioned James Franco/Seth Rogan movie The Interview, about two idiot TV personalities who somehow get an interview with Kim Jong Un and are conscripted by the CIA to assassinate him. The movie was a typical mid-2010s comedy that is, in my opinion, not particularly funny. Of course, the dubious quality of James Franco movies is not quite enough to spark a distribution war with billions of dollars at stake, so what caused the fuss? As you may have heard, hackers allegedly working for the North Korean government threatened terrorism on the scale of 9/11 if Sony Pictures released a film ridiculing the Beloved Leader. Sony, not stopping for a moment to consider how hackers could pull off a series of multi-city terror attacks, bowed to their demands and pulled the movie from release. The world was outraged. How dare a tinpot dictatorship threaten free speech? How could Sony bow to these whims? Can James Franco please stay away from the public eye until sometime in the mid-2020s? So, once again, Sony bowed to pressure and decided to release The Interview simultaneously on streaming services and in any cinema that wished to show it (in the end about 300 across the US). The Interview was expected to make millions as freedom lovers flocked to cinemas to support the First Amendment. And then the returns came in; in cinemas The Interview netted around $5m (£3.2m) over Christmas, not bad for a movie with such a limited release. Online, though? $31m. The prospect of watching the movie conveniently at home not only trumped the idea of going to the cinema, it blew it out of the water. Now in the context of TV and mobile, streaming has been welcomed with open arms. US cable companies are scrambling to embrace the model (see recent OTT announcements from Dish, HBO, CBS and others) and there’s no avoiding the rise of on-the-go mobile entertainment consumption which is fast approaching the $2bn mark. In this simultaneous-release game, Sony is $30m in the hole and almost out of cards … The only game changed here was just how much Sony left on the table. His argument can be summed up like this: Sony didn’t do a wide theatrical release and as a result has lost a ton of money, with the on-demand well assumed to have now run dry. Looking past his assertion though, we know that on-demand content has a far longer shelf life than theatrical content, because it never leaves the store-front. Even if the content only brings in $1m more from streaming in the US, that’s a million dollars more than would have been bought in from cinemas, almost all of whom have stopped showing The Interview – if they even showed it in the first place. Sony, however, is still pressing ahead with the old release model for international distribution, clearly influenced by the fact that Hollywood has no interest in testing the profitability of the streaming distribution model, beyond adding it to their home release window. However, the fact that this foray into online distribution took place in such a haphazard manner and still delivered impressive results has the studios and their affiliates terrified – so much so that studios are not recognising that there is still a place for the theatrical release model. There are movies that you need an 8fft screen and a sound system that could crack granite for – it’s called the Marvel 2015 release lineup – but not every movie is that kind of movie, and that’s okay. Popular music didn’t kill opera. The industry with a vested interest in protecting a dying model – after all, change costs money – will do anything to tear down the profitability and benefits of streaming media. The horror stories being put out – that soon you’ll only be watching movies on your iPhone – are garbage, coming from interests vested in protecting an increasingly anachronistic model. Both models work, it’s just that one side wants to pretend the other has no right to exist in its playground.